1941 red CDS "V" Hradec Králové and Tábor on/for official correspondence, 1x with straight line postmark Victoria!, 1x franked with. Postage due stamp good condition. 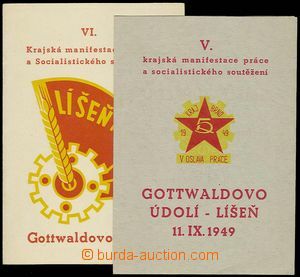 1949 - 50 2 pcs of memorial/special cards from komunistických manifestací in/at Gottwaldově valley in Brno - Líšni. 1939 USA Reg letter franked with. i.a. 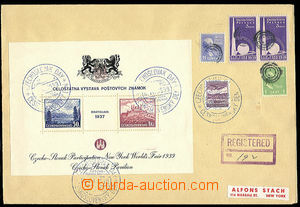 miniature sheet Pof.329/30 with additional-printing to World exhibition in New York 1939 (black) with exhibition postmark Czechoslovak Day 6.VII.1939 and American stamps in value 18c, dumb postmark, on reverse transit. 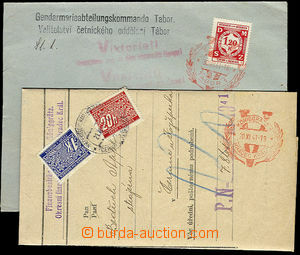 and arrival postmark., recipient A. Stach, good condition. 1932 MACCABI regional festival in/at Bohumíně 1932, card with blue additional-printing, 2x special postmark, franked, but Un. Vert. fold repaired from the front side practically small. 1940-41 5 pcs of entires with commemorative postmarks, Pof.PR13, PR50, PR52, PR74. Z from-that/of-it/ 3x Us, 1x as Registered . Without damage. 1939 letter with oval black cancel. "Pribinova Nitra celebrates osamostatnenie Slovak Rep. / 14.II.1939", 1x print also out of stmp good condition. 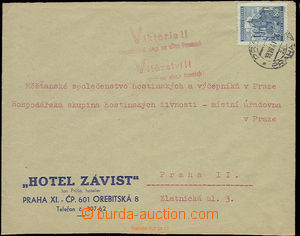 1947 Sionistická conference Karlovy Vary, envelope with additional-printing and commemorative postmark Karlovy Vary 1/ 13.VIII.1947, philatelic entire.